Brisbane-born Rachel Smith became a member of the Scottish Chamber Orchestra in 2014. 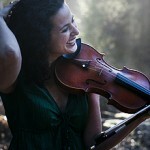 She is also a regular guest player with orchestras such as the Australian Chamber Orchestra and the Northern Sinfonia. From 2008 until 2010, Rachel was Principal First Violin in the Queensland Symphony Orchestra, which she joined as a member of the first violin section in 1997. A keen chamber musician, Rachel is the founding Artistic Director of the Stradbroke Chamber Music Festival, now in its eleventh year. Apart from presenting concerts, the festival incorporates an education program for younger school students who live on North Stradbroke Island, as well as an intensive chamber music program for tertiary students. Rachel has taught and coached extensively from beginner to tertiary level. She has been on staff at the Queensland Conservatorium of Music and the Southern Cross Soloists Winter School. In 2013, Rachel received an Australia Council grant for a period of study in the United States, aimed at furthering her training to become a qualified exponent of the Taubman Method of string playing and teaching, a comprehensive method that enables instrumentalists to understand and use the most efficient body movements in order to play with healthy technique and to eliminate injury and playing limitation. Rachel enjoys living in Edinburgh with her cellist husband, Eric de Wit, and baby daughters Nora and Elise. Her hobbies include cooking, learning Dutch, knitting, and reading on the couch.